South Eastern Sydney Local Health District (SESLHD) trained dental professionals to help clients quit smoking and implemented a number of solutions to increase accountability and knowledge in this area. Improves compliance with the NSW Health policy on smoking cessation. Improves health outcomes in people who access public dental services. Increases the knowledge, skill and confidence of dental professionals. Potentially reduces the risks of oral cancer, periodontal disease and other illnesses. Improves the quality of clinical notes for public dental clinics in NSW. Tobacco smoking is a major risk factor for many illnesses, including oral cancer and periodontal disease. As a result, encouraging patients in dental clinics to stop smoking has the potential to improve oral and general health outcomes. This is seen as an important strategy by the SESLHD Oral Health Service and outlined within the Integrated Oral Health Promotion Plan 2016-2020 (Goal 3: Improve oral health through more proactive and systematic care)2. The mandatory policy directive1 for public dental clinics in NSW ensures that dental professionals discuss the smoking status of the client and their interest in quitting smoking, while they are in the chair. They are also required to provide options for quitting, such as a referral to Quitline or brochures relating to smoking and oral health. This is particularly important for clients with drug and alcohol problems, clients with mental health issues, clients experiencing homelessness and Aboriginal people, who are all more likely to smoke. An audit conducted between January and July 2016 found the number of smoking interventions for oral health clients in SESLHD was quite low, with a 15 per cent compliance rate. Reports from the electronic database showed there was a marked variation in the number of recorded interventions among clinicians, ranging from 0-20 per month. A survey conducted with dental professionals found this was due to a low awareness and understanding of the mandatory policy, as well as a lack of confidence in counselling clients to stop smoking. It was determined that improving compliance with the policy would improve the knowledge and skills of staff, as well as health outcomes of clients. A one-hour group education session was held with dental professionals in SESLHD, to increase their awareness and understanding of the mandatory policy. This included role play and other activities, to embed knowledge in daily practice. Informal follow-up sessions were held during dental officer meetings and clinical forums, to update and reinforce the importance of smoking cessation advice. One-on-one consultations were held with five dental practitioners, to better understand the reasons for lack of compliance with the mandatory policy. The challenges with compliance were discussed and individual solutions were developed on a case-by-case basis. Clinicians were encouraged to place a smoking cessation sticker on their computer, as a reminder to provide smoking cessation advice to clients. An external tobacco cessation trainer was engaged to deliver professional development on smoking cessation. The one-day session aimed to increase knowledge, confidence and motivation among dental professionals providing smoking cessation advice. Prior to the project, regular audits of clinician files did not include smoking cessation advice interventions. The audit tool was updated to measure smoking cessation advice interventions. An acknowledgement sheet was developed to increase accountability among dental professionals. Staff signed it, stating they had read, understood and agreed to abide by the mandatory policy directive for Smoking Cessation Brief Intervention at the Chairside. Dental assistants were educated about the policy at SESLHD meetings and made aware of the ways they can support dental practitioners in complying with the policy. For example, if they know from the medical history that the client is a smoker, they can prompt the clinician to provide smoking cessation advice. An audit conducted between January and June 2017 showed that smoking cessation advice (recorded as item number 191) increased to 354 interventions, compared to 218 interventions in the same period the previous year. 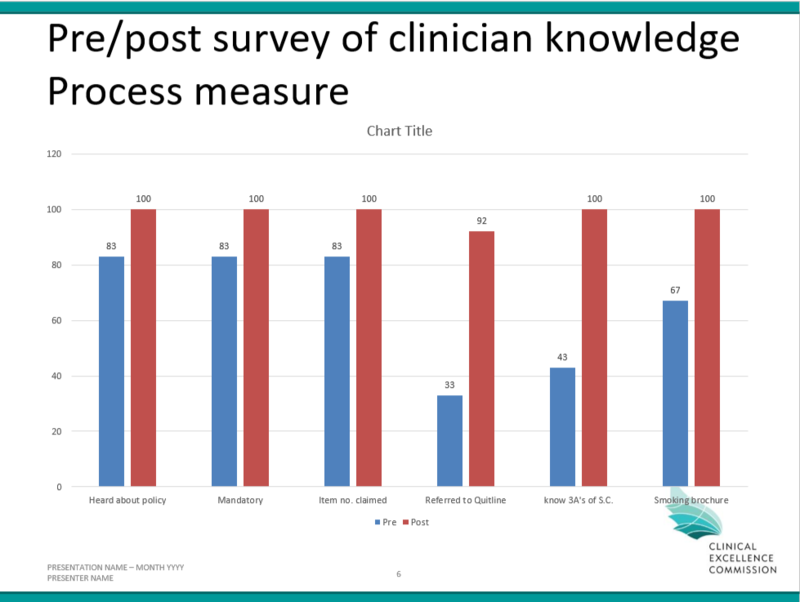 Surveys conducted with clinicians prior to and following implementation of the project showed an increase in awareness and knowledge of the mandatory policy. An electronic dental record has been implemented and used to track the number of smokers and the number of referrals to Quitline. This data could not be captured using the previous oral health information system. Engaging clinicians and discussing the reasons for low compliance at the start of the project was integral to its success. During the project, there was no way to track number of referrals to Quitline. In the new electronic system, there is be a way to track this number and generate a more meaningful measurement of outcomes. Engaging and educating dental auxiliary staff was very helpful. It is important to continue following up and improving interventions, to sustain the project and improve results over the long term. NSW Ministry of Health. Smoking Cessation Brief Intervention at the Chairside: The Role of Public Oral Health/Dental Services. Policy Directive 2015_030. North Sydney: NSW Health; 2015. South Eastern Sydney Local Health District Oral Health Service. Integrated Oral Health Promotion Plan 2016-2020. Caringbah: SESLHD; 2016. Dawson GM, Noller JM, Skinner JC. Models of smoking cessation brief interventions in oral health. NSW Public Health Bulletin 2013:24(3):131-4.